Guitar Center Inc. (Caa1 negative). Additionally, while the credit markets have remained open to refinancings, those with more challenged credit profiles and operating performance problems will face growing challenges in tapping the markets, especially in an environment where monetary policy is tightening. Meanwhile, spooked by the Toys "R" Us fiasco, many others will face the risk of vendors pulling the supply plug in the wake of Toys “R” Us bankruptcy, which was triggered when certain vendors cut the company off. As companies move down the rating scale, the vendor portion of the liquidity profile can become strained as concerns over the strength of the company are magnified. Tighter repayment terms, including the dreaded “cash on delivery” (COD), can have an even more serious impact on liquidity than a looming debt maturity. Without vendors, companies don’t get merchandise, and without merchandise, there are no sales. So in addition to the above 5, who else is on the list? 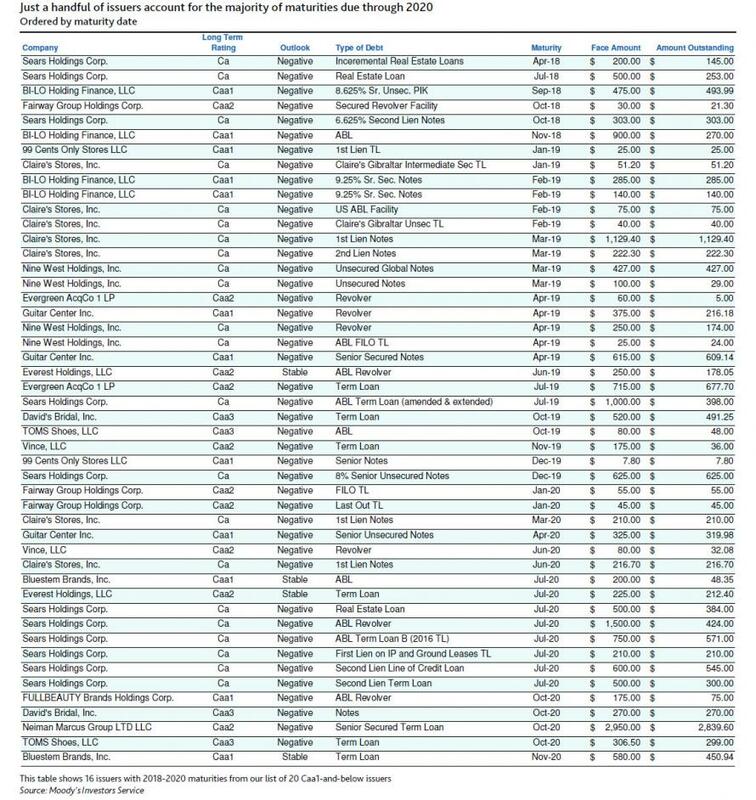 Many of the names on Moody's distressed list, and those that have filed for bankruptcy in the past 12 months, are, or rather were, sponsor-owned. 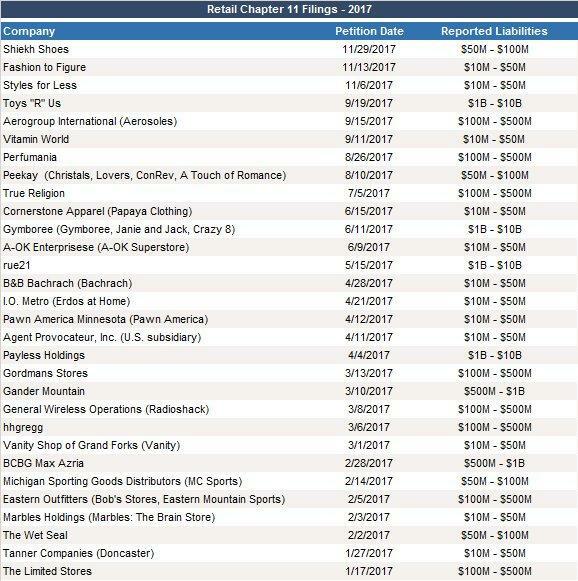 It will hardly surprise anyone that many distressed retailers are highly leveraged following sponsor-led LBOs. 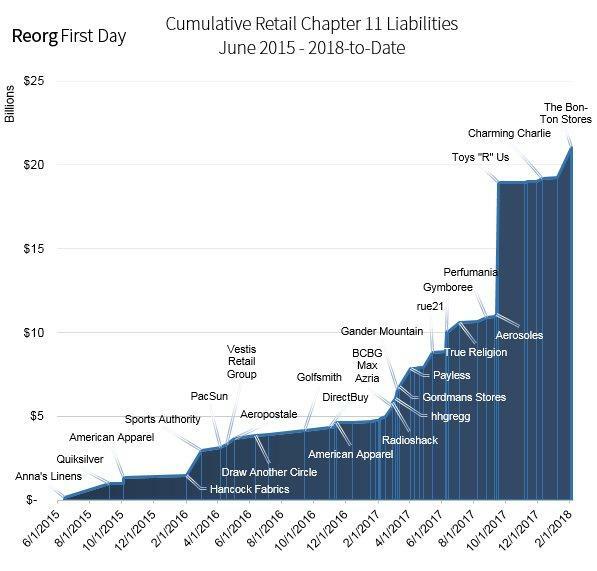 High leverage has proved problematic for the retail industry due to the industry's inherent cyclicality and operating income challenges post-recession. Such pressures have been vastly aggravated the past 10 years with the rapid rise of online competition, which has severely squeezed profit margins across the board. The debt loads assumed by many smaller retailers have created an untenable competitive reality: they are financially ill-equipped to deal with the changing retail landscape. They also lack sufficient resources to build out online capability, keep stores fresh, and fend off pricing threats from larger competitors. The successful retail LBO stories, such as Dollar General Corp. (Baa2 stable) and BJS Wholesale Club Inc. (B3 stable), have typically been those that haven't needed to compete online. The exhibit below lays out the quantitative characteristics of the 20 distressed issuers in Moody's Caa/Ca universe. Putting these metrics into perspective the debt/EBITDA Caa ”range” is 6-8x, with the EBIT/interest “range” 0.5-1x. Debt/EBITDA above 8x results in a Ca score, as does EBIT/interest below 0.5x. And before we present the full list of upcoming maturities over the next 3 years, virtually none of which will be made, here is Moody's brief discussion on whether the retail situation is improving. Buoyed by favorable macroeconomic conditions, as well as the potential favorable impact from the US Corporate Tax Law change implemented by Washington in late 2017, we believe retail is improving. However, we continue to believe that a “have/ have nots” phenomenon is accelerating, with the effect akin to a teeter-totter. As the larger, better capitalized retailers continue to grow and prosper, the smaller, highly-leveraged retailers are struggling harder to compete and survive. Capital structure: When leverage remains stubbornly high and operating performance fails to keep pace, the capital structure is significantly weakened over time. Ultimately, the burden of too much debt always wins. A leveraged capital structure has deleterious effects for liquidity, capital investment, and competitive positioning. Liquidity: This is the oil that keeps the engine running. An unfriendly or onerous debt maturity schedule makes it difficult to keep the oil flowing, and as we saw with Toys “R” Us, can create enough vendor concern to cause a bankruptcy due to a trade squeeze. Capital spending/investment: Without money to invest, stores get tired and therefore become unattractive to shoppers. Websites lose their ability to keep up with competitors and become unattractive to visitors. Supply chains slow down, negatively impacting inventory efficiency. Competitive position: Competing with larger, better capitalized retailers is challenging in a static environment. Today’s retail is as volatile as ever driven by the secular shift to e-commerce, making competition the most acute it has ever been. And, in the midst of this, Walmart and Amazon are fighting the battle of the century over market share, using price as a key weapon. Virtually every other retailer runs the risk of being collateral damage in this battle, making flexibility critical, which is an asset most lower rated retailers do not own. That was Moody's being diplomatic. The real answer, as shown in the table below which lists the full schedule of upcoming debt maturities by retail issuer, is that unfortunately no, for most retailers except a handful of very prominent online names, the situation is not only not improving, but it's never been worse.